Today I didn't want to get up early enough for 3 hrs of z2 w 3x15' SST, so instead I'll get about 2 hrs w 2x30' at SST. I'm tapering for Barrio Logan, is what I'm telling myself. Tuesday Night Worlds; on tired legs I did pretty well. There had to be over 100 people out there and I didn't do myself any favors going into the climb towards the back of the field. Descending is improved but I still need to drop another 20 seconds (out of a 4 minute descent) or so to be competitive. Went to the gym afterwards; leg work with 3 sets of 6-10 (to failure). I've somewhat hit an epiphany that if I want to be competitive my leg strength and leg speed need to improve. Whether I can do both of those things while putting in endurance work is a big question. Good, I'm riding as domestique for you so be fresh! Looks like there is one good cat 4 sprinter in our field to watch out for (6 wins this year), with a teammate. sounds good, I'm looking forward to going for it!!! Good luck @TMonk ! I don't fawn over power numbers often, but that guy is a good cat 1 sprinter. They'll send at least one guy on a break that can make it stick as well. I've placed 3rd and 4th in this same race in years past (Barrio Logan Cat 3/4). Mtbing after work today. Had some issues with the bike so I took it to the shop before hitting the trail. Turns out the xd driver is completly shot. Need to find a replacement. Still tried to ride the trails, and while beautiful as they were, it was more pushing my bike uphill and around sharp cliffs than actual mtbing. Next time I'll read the sign at the trailhead that says "bikes not recommended" before i go up the hill. 2hrs with 6x8min @ 102% got a zwift orange jersey (I always kind of win them through attrition of others above me and then only hold them for a couple of mins until someone fast claims the spot lol). Signed up to race 65 miles on Saturday, have only done one crit this season so I'm anxious to see how my fitness translates to a long road event. Mtbing again today. Guess I should dust off the road bike since I signed up to race this weekend. 9.1 mile tt on Tuesday. It was wet and rainy and windy..still did because bikes. 260 average and 24:30 (did it on my road bike). Happy with that considering conditions and current fitness. Today was supposed to be 4x4 vo2, but i modified the workout...rode with a friend who has 2x30 sst on the plan for the day. I did a 4 minute vo2 interval then drafted off of him the remaining 26 minutes during both of his intervals. Averaged right around 215 in his "draft", since he was on his tt bike. Did that twice...felt like a pretty good workout. Five days of work travel/hotel/training. I usually pack workout clothes but indulge in alcohol, sweets, and never even check out the hotel gym. This time I've actually followed my plan, avoided alcohol, and even did a few workouts on the gym spin bike. My CTL has only dropped a couple points. Super happy to not have to dig myself out of a fitness hole after a week of travel, for a change. Decided to drive up to Idaho to race tomorrow. So openers today and met up with a teammate half way through. I think that's a bigger accomplishment than most people realize. My wife travels for work about 26 weeks out of the year and its hard to get anything outside of work done and when the weekend rolls around you're fried from jet lag. Just a little 6 minute vid set to Depeche Mode from the Thursday hammerfest. Well, this is embarrassing. On Saturdays the River Ride has an A ride and a B ride. The B ride leaves 15 minutes earlier than the A. It starts and finishes on the same route but the middle is different. Sometimes as a warmup, I'll go out with the Bs, do part of the ride, then turn back and catch the A ride. That was the plan yesterday. There'd been some chatter on FB about Cat 3s and higher who should really be doing the A ride, but going on the B ride and blowing it up. So as a 3, I was conscious of that, but also wanted to do my share of the work, so I made sure I was part of the rotation early and often. Unfortunately, on one of the rotations I hit the front at the point where the B ride turns off the Garden Highway, but I totally brainfarted and kept going straight. After a while, I was wondering why no one was pulling through so I turn around and the rest of the group turned except for me and a few unfortunate guys who were following me. D'oh! Chased the group but never caught them until they regrouped after the first sprint point. Oh well, at least I got a more than decent super-threshold workout with the chase. Plenty warmed up for the A ride, then. Awesome ride today. Saw a group ride get posted on FB that Jamie Driscoll was hosting as a get together to ride and promote his new nutrition company (which ACTUALLY tastes good). Ride hard up these awesome (STEEP) climbs in park city and then regroup at the top and ride together to the next. 3 big climbs at altitude. My power wasn't there and I generally felt pretty bad climbing after the first climb but stayed pretty close to some of the big shots that were out riding. It really was a cool day to be around some big shots in Utah. Jonathon Page made a guest appearance out mountain biking, some top notch gravel racers were there too. Also some guy on one of Peter Sagans bikes from when he trained up in park city last year. Name badge still on it with Rainbow stripes. Next time I do a ride like this, I'm gonna put the computer in my back pocket and just ride. Even if it means suffering hard on the long climbs, these types of things make great tools to avoid burn out. 54 miles, 5500 feet of climbing in 3 climbs topping out over 9k feet. Last edited by Ttoc6; 04-29-18 at 04:17 PM. Record numbers for me. Those are 1s intervals so nothing sustained. 10000% effort, I almost rode off the left side of the road doing this effort. I've essentially waterboarded my body for 3 weeks, feel like I can do another but going to do the smart thing and take an easy week. Of course, that's just Cat 4 training, and not even Cat 4 from 5 years ago so its not even really training. Won't they shoot you for listening to that kind of music? seriously, though -- fantastic effort!! 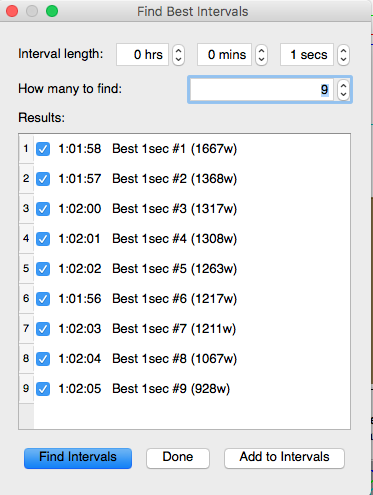 According to Golden Cheetah, I haven't cracked 1k watts yet this year. Nice work dude! Right? It was a 9s effort at best, the 10th second I was winding down very hard. And I did the jump literally in front of my house, saw the road was clear, and threw all caution out the window. Ended up inadvertently veering left as I went. No way I'd have been able to do such a jump in a race, it would have been dangerous. But now that I have some "attainable goal" in mind, my goal will be to be able to do big jumps while retaining enough control over the bike to make it okay to do during a race. One caveat. I don't have my other training data easily available but this was by far the highest number I've seen (previous was 1550w peak, and then it's in the 1450w range), and it's the first time I've done a massive outdoor effort on the wireless SRM. I'm wondering if this data is comparable to the wired SRMs I had. I'm going to put together the red bike with the second wireless SRM, wondering if the numbers will replicate there. Maybe I have a 300w FTP and didn't realize it. Actually, that's the next thing I checked, because I was holding some high wattages (and blowing myself up) during the same ride. I didn't do any very long for me efforts (20m) but I definitely went hard for 1m to 5m. Best intervals for those times, 326w (1m) and 211w (5m). So the numbers seem real.